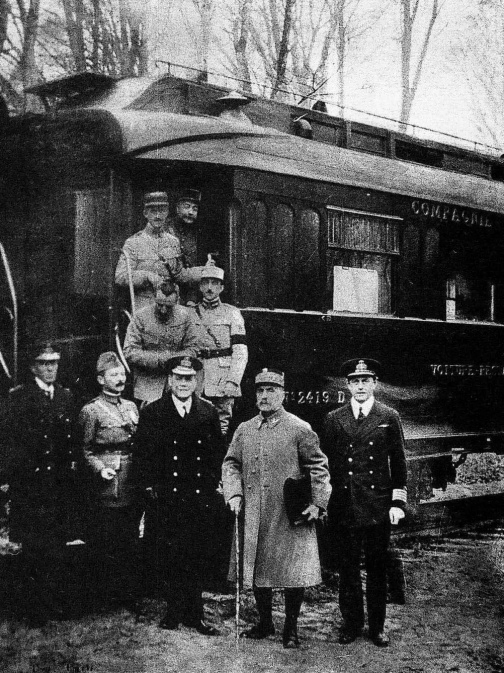 November 1918: The railway wagon, number 2491D, constructed before the beginning of the 1st World War, was taken to the forest of Compiegne, where the German delegates accepted the terms of peace, dictated by the Allies. This carriage was used again by the Germans, for the French surrender in 1940, and then the carriage was destroyed by Allied bombing in 1945. No civilians participated in the discussions of the 1918 surrender terms, in the railway carriage. In November 1917, the British Parliament was informed that they were to expect a long continuation of the war. In the autumn of 1917, the German foreign minister, made informal approaches to the British, offering to give up the Belgian ports of Ostend and Zebrugge (German submarine harbours), but Germany was to retain the rest of Belgium. The German objective was to divide the Allies, with a separate peace with the United Kingdom. London rejected the peace offer from Germany. To understand why the First World War ended in November 1918 is to also question why the war did not finish earlier. Nobody expected the war to finish in November 1918. There was a domestic political stalemate, but all the Allied governments were committed to continue fighting the war to its conclusion. Lenin and the Soviets, seized power in Russia, and soon made peace with Germany, which enabled the Soviets to consolidate their power. The Soviets had ambitions to spread their political theories to the rest of the world. The cause of the German revolution was the realization of the impending German defeat, combined with the Allied naval blockade. Before the German/Russian peace treaty, the Americans attempted to persuade all the Allied countries to follow as a basis of peace, President Wilson’s 14 points. In October 2018, the Germans made contact with the Allies to make peace, based on President Wilson’s 14 points, which earlier in 1918, the Germans had rejected. The reasons that Germany requested an armistice, was the surrender of Bulgaria, followed by the Austrian/Hungarian empire, combined with the failure of the German western front offensive in early 2018, and the condition of the German army as well as the home front. Germany is the single central strong European country, while its role in 1914 caused the First World War to commence. By 1916, the German High Command had taken over the running of the war, with the right to veto any foreign policy, and this is despite Germany having a strong democratic political system. Bulgaria concludes an armistice with the Allies, as the recent Allied offensive on the Salonika front, causes the collapse of the Bulgarian army. The Austrian/Hungarian armies are unable to help the Bulgarians, as the Allies had launched their own offensives on the Italian and Western fronts. One of the advantages that the Allies had, was the tank. 480 Allied tanks were used at the Battle of Amiens, with only a ¼ of the tanks being available to be used at the end of the day. The tank itself was not a war winning weapon, but proved to be a descive advantage, if used properly. The Allies also had a tremendous advantage in numbers and in heavy artillery. Aerial photography was extensively used by the Allies for identifying the German front line, strong points, artillery and supply dumps. The railways were used extensively by both sides, with the Germans using the Belgian railway system, with the Allies using the French railway system, combined with thousands of Lorries, with plenty of petrol being available. The manufacturing of munitions in the UK and France was increasingly made by women, with the Allies making a far more efficient use of its resources and manpower. By March 1918, 250,000 American troops were serving on the Western front, and by November 1918, this had increased to 2 million American troops. The Americans suffered losses of 55, 000 men, during the First World War, which was almost the same losses as the Americans suffered in the Vietnam war. One million German soldiers are lost in the March 1918 offensive, and German soldiers, are increasingly starting to surrender. When the Germans started to seek peace, the Allies are initially suspicious of the German and American intentions, as neither Germany nor the Americans had informed their allies of their proposed peace moves. From the time of these proposed peace proposals to the armistice of November 1918, a further 1 million casualties are inflicted.